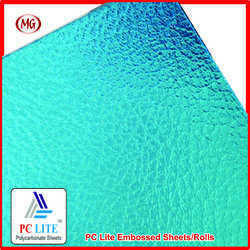 Pioneers in the industry, we offer pc lite embossed sheet, raindrop embossed sheets, ps star embossed sheet, ps diamond embossed sheet, ps scattered water sheets and ps rift embossed sheet from India. Our wide range of high quality PC Lite Embossed Sheet can be used in various ways and for various applications such as for veranda glazing, safety or vandalized areas indoor/outdoor signs or instrument panels. They are exceptional impact strength and virtually unbreakable. Hence, it can be widely used in construction and decorations. Further, they are UV resistance, self-extinguishable and light transmittance. Such rolls and sheets come with tiny embossed patterns on one side. Such design not just enhances the look of the polycarbonate rolls and sheets but also enhances its firmness and anti-static function. Besides, they add special effect to the sheet. Backed with rich industry expertise and efforts of our diligent team of professionals, we offer high quality Raindrop Embossed Sheets. 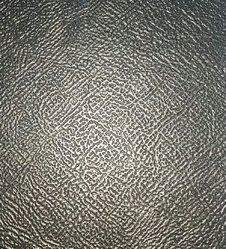 These sheets are just like solid sheets except for its texture or patterns, each one embossed on both of its surfaces. It provides proper diffusion of the natural light that streams in, thereby, ensuring uniform dispersion of light over a large area. These products are similar to solid sheets except that textures or patterns are embossed on one or both of its surfaces.These products are pable to perform in wide range of temperature up to 100 degree Celsius. To meet the diverse requirements of clients, we are offering a qualitative array of Star Embossed Sheet. 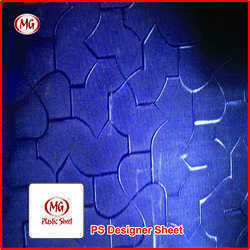 The wide variety of designs of embossed and pattern sheets manufactured by us will surely amaze you. 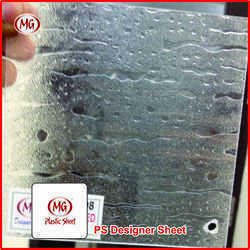 Our products comprises of embossed sheets, transparent embossed sheets and colored embossed sheets. These products are similar to solid sheets except the embossed and patterns on one or both side of the sheets. These sheets are capable to perform in wide range of temperature. We are among the most trusted companies involved in offering an extensive range of Diamond Embossed Sheet. We manufacture these using best quality material and advanced technology that ensures their long life. In addition to this, these conform to the international standards for quality levels, thus highly demanded in market. Apart from this, the offered panels can also be availed by clients in various specifications as per their varied requirements. By keeping track of the latest market trends, we are engaged in offering a commendable range of Line Embossed Sheets. These are used for indoor and outdoor decoration purposes. These are manufactured using excellent quality material that meets ISO and other international standards. These are prepared by compressing the several layers of polycarbonate and other material. These are easy to clean and wash and are available in several striking designs, shapes and sizes. Our firm has a very modern and sprawling infrastructure which has all the latest and sophisticated facilities to offer high quality PS Rift Embossed Sheet. Our firm has a very modern and sprawling infrastructure which has all the latest and sophisticated facilities to offer high quality. 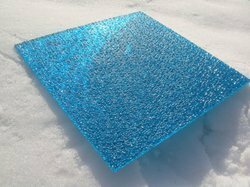 These are solid polycarbonate sheets with a texture on one surface. The purpose of texturing is to provide light diffusion and prevent see-through vision as deemed necessary for a variety of applications. We manufacture various Polystyrene Embossed Sheet in different thickness. Our team of expert professionals will ensure that the sheets are thoroughly checked ahead of final dispatch to ensure compliance with the quality standard desired by our customers. 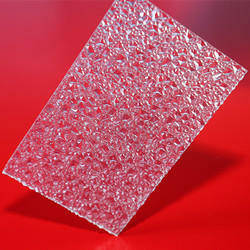 We are one of the largest manufacturer and supplier of embossed and pattern polystyrene sheets. 100% virgin materials as per the international quality standards are used by us to manufacture such sheets.